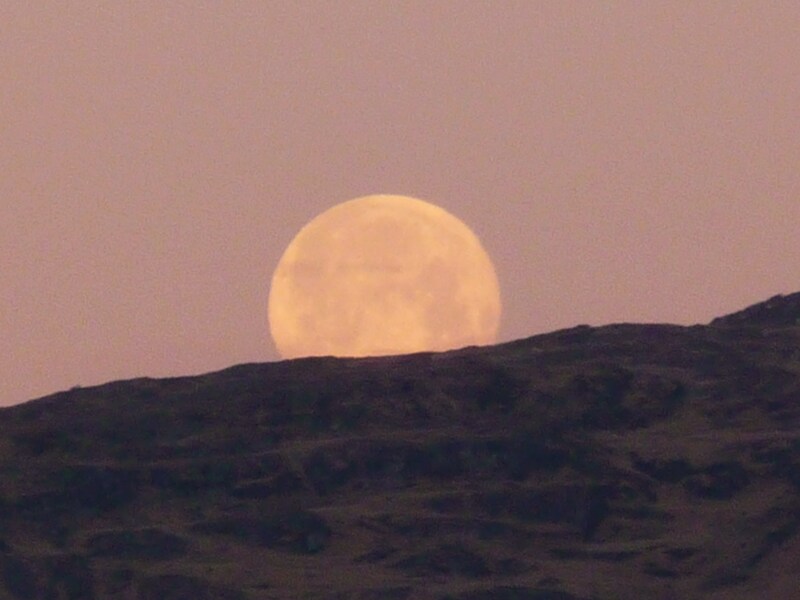 Many moons have waxed and waned since I last ventured into the world of social media. I hope to correct that in the very near future. Initially, however, here is an interview I gave recently for my publishers, explaining why The Hidden Hand has been so delayed and what has been happening in the world of Essi Tolling. The good news is that there is now a newly-revised edition of Watchers available, the paperback version of The Hidden Hand is out on amazon and the kindle version will be online from August 8th 2017 and is available for pre-order now. So, lift-off at long last! More from me very soon, but for now, here is the recent interview. KP: Essi, many readers have been asking about you and wondering where you were and when they could expect the second book. Essi: Firstly, my apologies for the extremely long silence. Secondly, more apologies for the delay in publication of the second book in the Tilly Greenway series. I’m happy to say that both issues are at last remedied with immediate effect! It has been a challenging time since I last posted an entry on my blog or sallied forth into the world of social media. As readers will know, back in the spring of 2013 my publishers asked me to make some changes to the storyline of both book 2 and 3 in the trilogy. This was largely because things that were destined to happen in the books were actually playing out in the real world in a way which they were not comfortable with. KP: Can you expand on that a bit? Essi: To give you an example: in my last blog post I forecast further wars and predicted that Syria would be the next place of major conflict. That, like many other parts of the old subplot of the books, has sadly proved to be true. With an underlying element of criticism of governments (and the powers that run them) deliberately stirring up wars for their own benefit, it was deemed that the storyline was in fact a little too “hot to handle”. As it turned out, making a few “small changes” to a long-planned, complex plot – with plenty of subplots for good measure! – was not as simple as it first appeared. Imagine trying to change a menu for dinner when the ingredients are already in the kitchen, the starter has been eaten and main course is ready for serving…and you get an idea of what I mean! Then in 2013 a series of events meant things had to be put on hold. These included health issues for the main editor at Katy Press and the terminal illness of my father, who passed away early last year. I returned to the UK to be closer to my parents and family and my focus moved away from the books. KP: We are very sorry to hear about your father. It must have been a difficult time for you. Essi: Yes, losing a parent creates many challenges – both foreseen and not so – and moving country, along with setting up new work was certainly an upheaval. During this period I also suffered a debilitating episode during which I went temporarily blind followed by a period of several months not having full coordination either physically or mentally and then two years of frequent, severe migraine attacks. Am all fine now, but it was only midway through 2016 when I finally felt ready to return my attention to the Tilly Greenway stories. I should probably have let readers know before now, but somehow the timing has not been right. I wanted to be able to be fully engaged again, to reply to messages and emails – and of course to be able to make school visits, do book-signings etc. All in all, things simply took the time they did. KP: Your decision to revise Watchers I know you made along with the publisher’s suggestion to revise the covers and book size. What led to your decision? Essi: Well…there was the whole ISIS issue (another example of strange synchronicity between fiction and reality that did not help!) which just had to be dealt with. 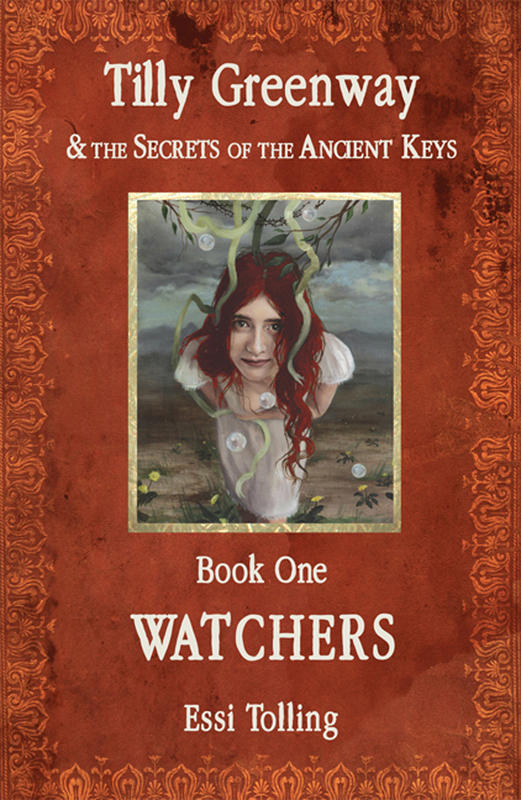 For those of you who read the original version of Watchers, you will know in the story there is a secret society that runs the world from behind the scenes. I called that society ISIS. This was a deliberate choice. The name is an acronym for the Inner Sanctum of the Inner Sanctum, but I chose it more specifically because of the resonance with the Egyptian goddess, the first well-known mother-with-child archetype. This fitted in with my idea that those involved in “dark” magic hide behind the cloak of seeming-lightness (both in the books and in reality!). In this case, they were using the name deliberately to corrupt it. It also fitted well because back in the late 18th century, Robespierre and his Illuminati cohorts chose to use a sheaf of corn/wheat as their symbol during the French Revolution– an image long associated with goddesses like Isis, Ceres and so on. So there was some historical basis for using it in the stories. However, events in the world overtook me. On my return to the UK I realised that the only resonance the name has for people now is its association with the terrorist activities that have become an increasing part of our world. This itself was another irony, given that in the books the Director of Terror – a woman responsible for increasing terror rather than helping to diffuse it – was a part of the secret shadow-government who carried that name! Obviously, with all the horrific things that have been happening in the world, this had to be changed and I apologise to anyone who has read the original version in recent times. No offence was intended by the use of the name. Indeed, when I drew up plans for the books back in 2008, the only meaning of the word ISIS was the goddess herself and there was no way of knowing how that particular name was to become so high-profile and why. This year, therefore, before releasing The Hidden Hand, the old copies of Watchers had to be pulped and a new version produced. This has now been completed. ISIS has been replaced by HORUS (more on what this means another time) – a name I hope will not be picked up on in quite the same way! KP: Are you happy with the new look Watchers? Essi: Absolutely! I love the new cover. 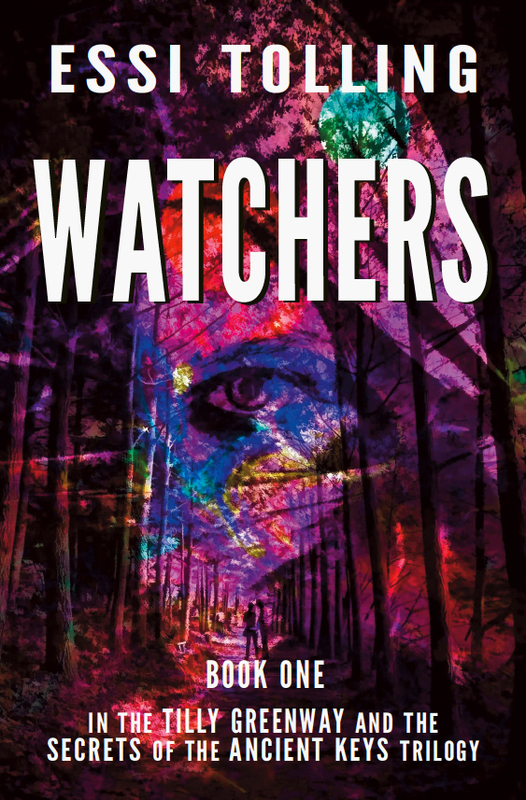 It is more in keeping with how book-covers in general have evolved over the six years since Watchers was first published and suits the story perfectly. I love the single eye (reminiscent of the Eye of Horus!) and the pathway through the trees, with Tilly and Zack in what looks to me like a dreamscape. Perfect! The cover of Book2 is also wonderful – as are the new in-text illustrations by fabulous artist Meraylah Allwood! On top of that, I was happy to be able to make some revisions to the text. There was no change to the story. It was more a case of tightening the language in some places and reverting to the opening sequence that had been in the very first draft of the book which in hindsight I preferred. There was also some clarification of the relationship between HORUS, The Others and the Dark Brotherhood. Without wishing to give any plot-spoilers, I’ll leave it at that, but I think readers of the original book will enjoy what I see as improvements in this revised edition! NB Make sure you get the 2017 edition. Several copies of the old edition are available through re-sellers, but for now the only way to get the new edition is direct from amazon. The new edition is also available in kindle for only 99p in the UK, 99c in the US! KP: What can we expect from The Hidden Hand? Essi: Again, I don’t wish to say too much about it as it would be a pity to spoil any surprises for the reader (of which there are plenty). Suffice it to say that The Hidden Hand has all the magical elements of Watchers, including a host of fantastical creatures (sea monsters, dragons, bogwights and giant swans to give just a few) mixed with a slightly darker edge than in Book1. A new baddie joins the throng of people hunting Tilly and Zack and the Dark Brotherhood come to the fore as the hidden history of the world is slowly revealed. I can reveal that much of the story takes place on the south-west coast of Ireland, including a visit to Skellig Michael, a place featured in the latest Star Wars films…yet another example of one of the strange synchronicities that have accompanied the tale as Skellig had been set as the location for book two back in 2009! I’ve deliberately kept the chapters really short (something I know a lot of people enjoyed) to keep the story rattling along, whilst still having time to explore the magic. I’m sure it’s always a bit nerve-wracking when writers launch a new creation on the world and I have to admit to being a tad nervous as we finally approach publication, especially after the success of Watchers. All I can do is keep my fingers crossed that The Hidden Hand lives up to expectations and say that I’ve written a book that I love and enjoy. Here’s hoping plenty of others feel the same way! KP: Thank you Essi for chatting today and we look forward to the release of The Hidden Hand! Essi: You’re very welcome. Again, I apologise to all the readers who have waited long and patiently (and to those who waited long and impatiently!) for the second instalment. I should perhaps have explained things earlier, but one thing led to another and I’m afraid that when I focus on writing I’m inclined to withdraw from the world outside. Thanks to all my readers for your encouragement. I look forward to reconnecting with those of you who have already been in touch and to making new acquaintances with those who are discovering Tilly, Zack and the mysteries of the Ancient Keys for the very first time! One thing is for sure – you definitely won’t have to wait so long for Book 3! I’ve not been blogging for the past few months because I’ve been working on the second and third books in the Tilly Greenway series. 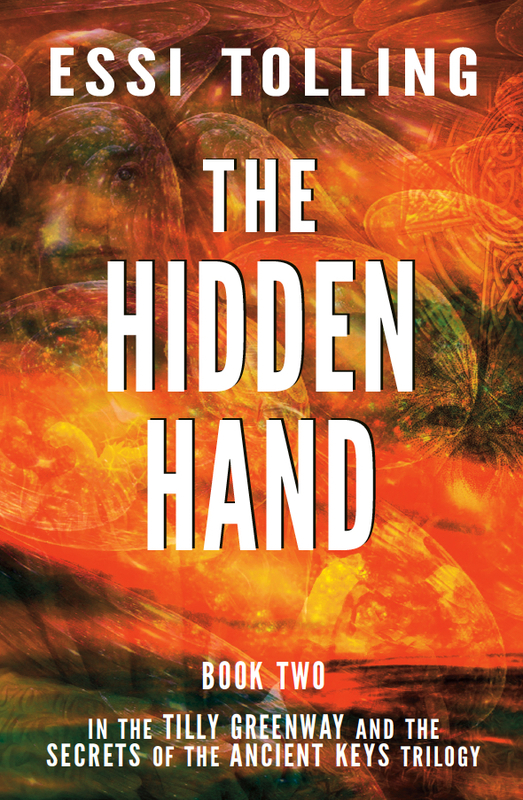 The second book, called The Hidden Hand, was due to be released this spring. That’s all changed. My publishers have decided that some of it is simply too contentious, given what is happening in the world right now! Readers of Watchers, the first book in the series, will know that the story blends old-style myth with a modern-day conspiracy tale in which the plot revolves around a shadow-government that rules the world from behind the scenes. I’d always wanted to mix these two elements because I like both and although they don’t seem to match, I wanted to do something that no one else was doing – to break new ground. I’m really glad I did. With letters and emails flooding in from readers of all ages who love Watchers, I’ve felt that I have a mandate to continue on with a story truly unlike any other. Little did I know, however, that so much of my fictional plot would turn out to be virtually identical to what is going on in the real world! I’m fascinated by dreams and visions and how they have shaped our history. It seems prophecies have flourished all over the world, from the earliest Sumerian writings, through the religious texts of almost every culture, including the bible, the Oracles of Ancient Greece and the Sybils of Rome, through Nostradamus, right up to today. My particular writing method is unusual. I use a technique I have developed called the Alpha State Meditation. All dreams happen when our brains dip down into the alpha-wave pattern, rather than the beta-wave of waking life. So, if you like, I dream the stories – neither fully conscious nor unconscious – which is perhaps why so many people have written to me saying that the style is very visual. It’s an interesting way to write; like watching a movie where I can become any one of the protagonists, experiencing a scene from their point of view (I’m pretty sure we’ll be able to do this in cinemas soon). 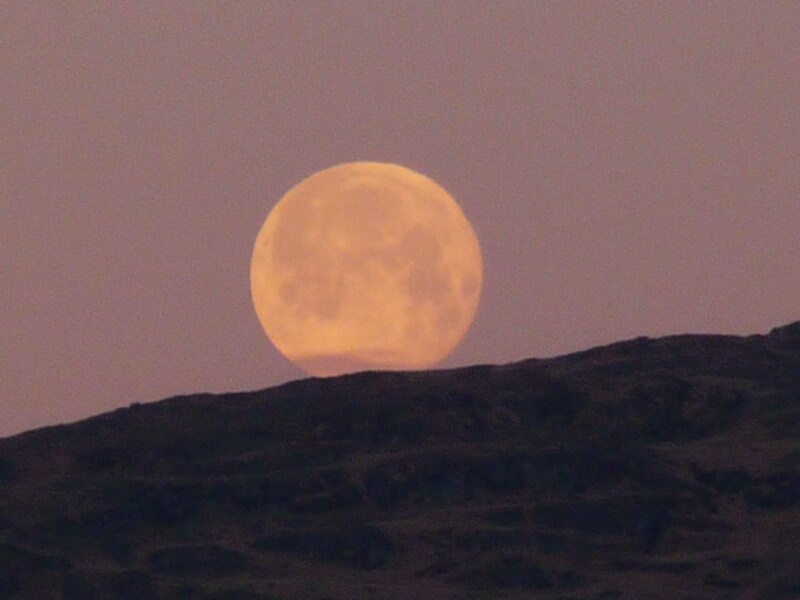 So, whilst I may have the overall plot worked out in advance, I am often surprised by what unfolds. I’ve even had new characters arrive “out of nowhere.” I’ll write more about this technique another time. For now, let’s return to the reasons The Hidden Hand has been held back. Most conspiracy theories are just that: theories. The Illuminati, however, are real. Formed in the late eighteenth century by a German called Thomas Weishaupt, documents intercepted in Bavaria twenty years later revealed that Weishaupt and his co-conspirators had the specific aim of infiltrating the highest echelons of government, the church, the media and businesses worldwide in order to gain control over the world’s population. They began in France, where their success can be measured in the number of heads severed by the guillotine. Every high-ranking member of Robespierre’s “Reign of Terror” was a member of the Illuminati. 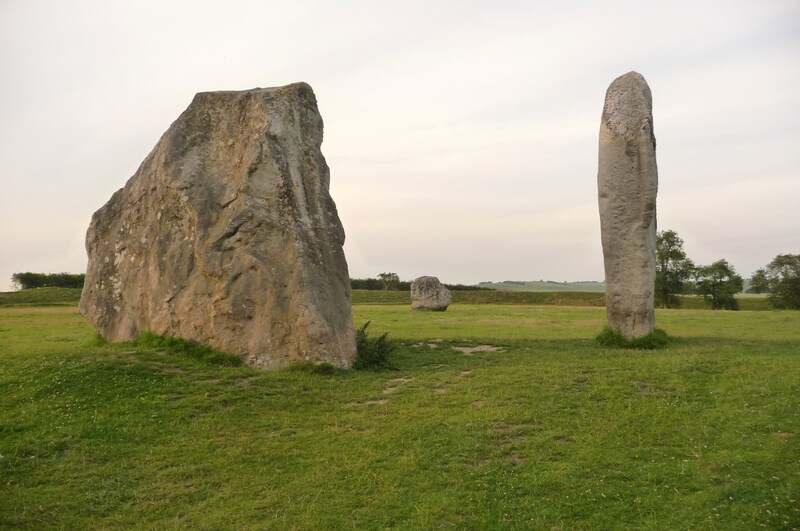 This seemed a perfect place to begin a tale of mystery and intrigue that stretches right back to the dawn of time. As you will find out when Book 2 is finally released, the fictional shadow-government of my story forms an “Axis of Power” that involves London, Washington DC and Rome. Intent on reducing the world’s population, this Axis of Power begins with a programme of micro-chipping Londoners with mu-brains, tiny microchips that control human thought. The twist in the tale is that these people are working with a host of invisible entities who live in another dimension and who feed off human fear. This idea itself is not new. Many of our oldest stories are filled with warning of demons and devils who visit us in our sleep, like the Night-Mare, the Succubus or the Incubus. In the Tilly Greenway series, the shadow-government does a deal with these demons, spreading fear through the media so that people are unwittingly turned into a source of food or made easier to manipulate. I had originally foreseen the use of the Olympic Ceremonies, the Music Industry and war in the Middle East as the main events/stages for this shadow-government to drive through its plans during Book 2 and 3. Having seen the Olympic ceremonies last summer, having looked at the images and words being pumped out in many music videos and having followed the wars that have rocked Iraq, Egypt and Libya – with the very real danger of war in Syria and perhaps Iran to come – it has become plainer and plainer that the fictional plot of my books has to a large extent foreshadowed real life events. The original draft of The Hidden Hand begins with a quote from Malachy’s prophecy and continues with a Papal Conclave during which Petrus Romanus is elected. Back in the real world: Benedict XVI was the 111th pope on St Malachy’s list. Benedict surprised the world by resigning on February 28th, but what no one has mentioned is that February 28th is the Feast Day of a certain St Romanus! As I write this post, the 115 Cardinals who will decide who will become the 112th Bishop of Rome are entering the Sistine Chapel. The Conclave has begun. Obviously, when I was drawing up the plot of the Tilly Greenway series, I had no idea this was going to happen just a few weeks before the second book was due to be released. Given all this, my publishers have asked me to re-write some sections of the next two books. Without spoiling the plot for you, that’s about as much as I can say right now! 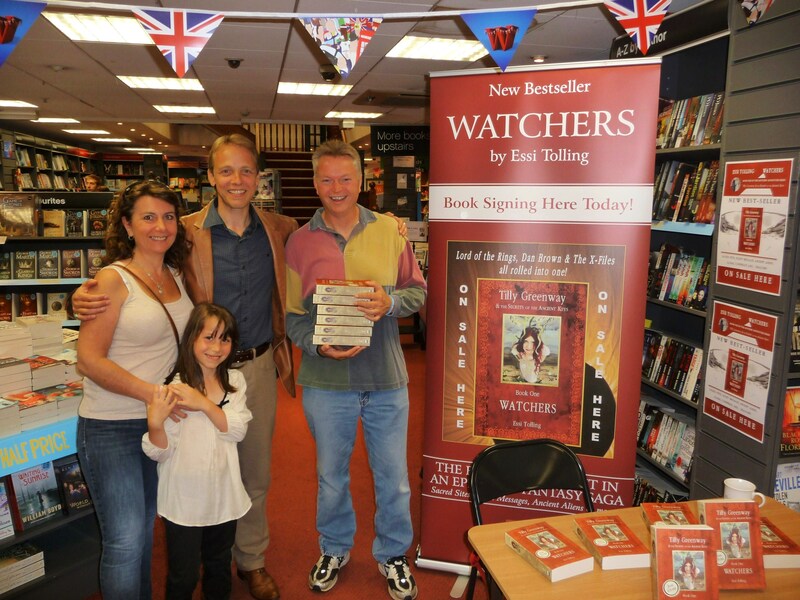 This autumn I am doing tour of Waterstones bookstores, signing copies of Watchers. It’s been a busy programme, with signings every weekend since the middle of August! I love doing these events: such a great way to meet readers, chat about their favourite books – and, of course, to have a browse around the shelves myself too! That first page is always the one that does it for me! Don’t get me wrong: I welcome the surge in e-book sales. More people reading more books has to be good news, and I have a hunch that many people who read the electronic versions will go on to buy physical books too. But there will always be a special place in my heart for bookstores, much as I prefer reading from the page rather than the screen. Maybe it is because it’s a social thing? Although we hunt for titles in our own little “bubble”, when we are in bookstores we share the space with others who love reading – whereas shopping online is a solo experience. All signings are between approximately noon and 3pm. Do come along and say hello. I’d love the chance to meet you! 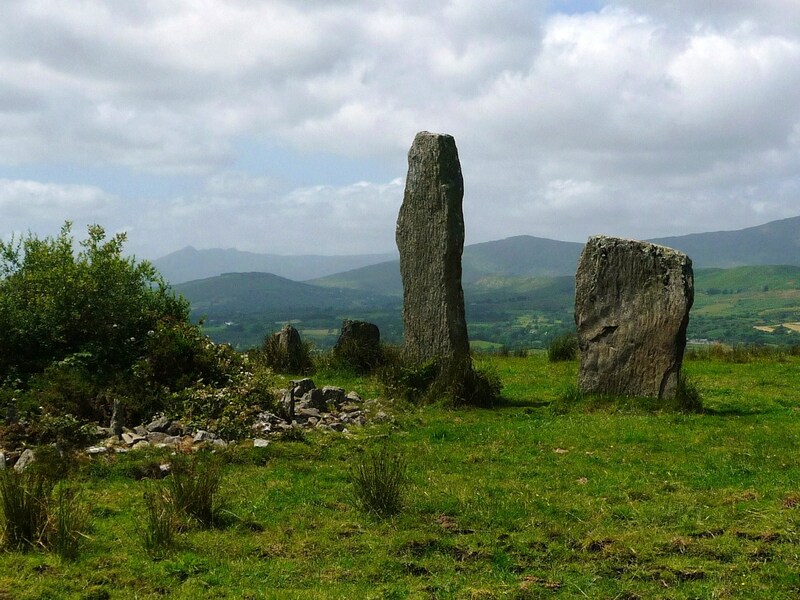 One of my favourite sites in south-west Ireland is the Kealkil Stone complex. It’s not big, but it IS spectacular. 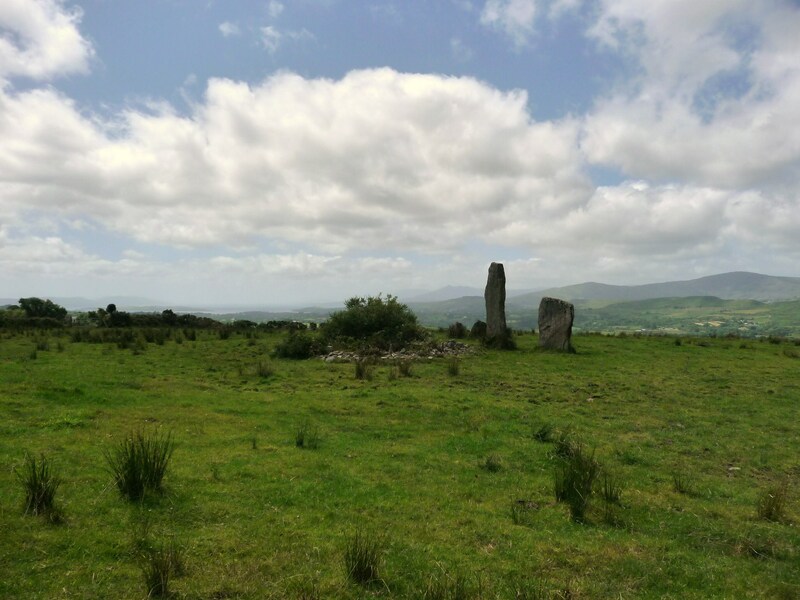 Looking out across the Ouvane Valley to the north and Bantry Bay to the south, the site is the largest of a line of stone circles and standing stones that runs along the spine of a mountain-ridge from East to West until it meets the bay. 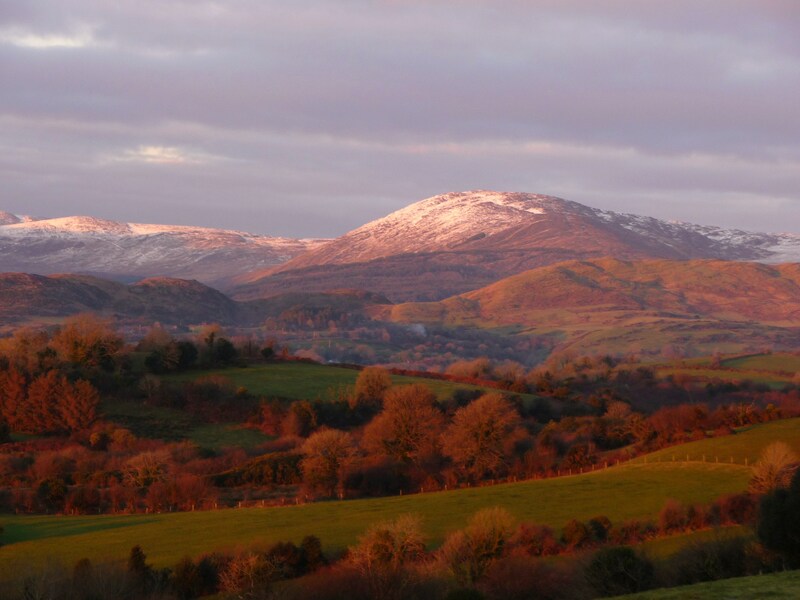 Most of the hilltops in this area are dotted with such sites. Apparently the tallest stone at Kealkil was once six feet higher than it is now, but it broke and had to be shortened when it was re-positioned. 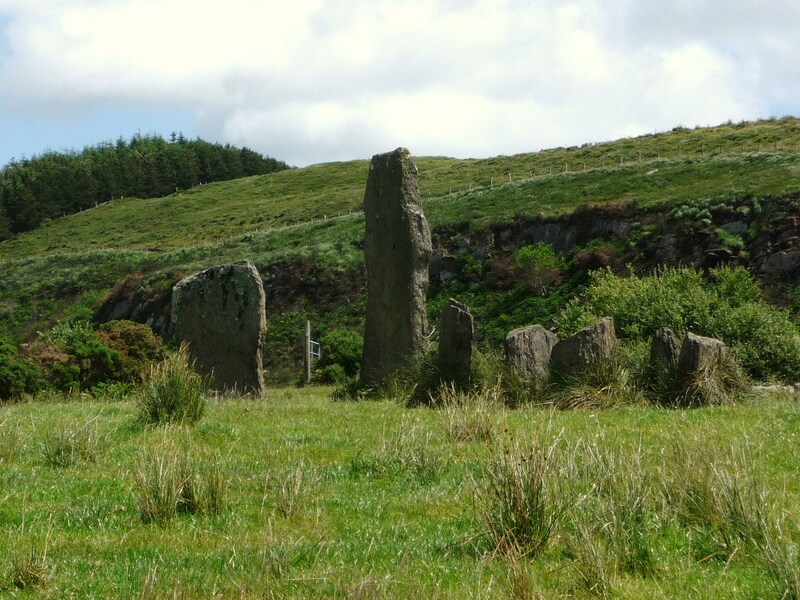 As well as the two large stones, there are two circles at Kealkil – one of five stones about chest-high and an even older stone circle that is largely hidden in bushes and is made up of stones that are no more than a foot high. 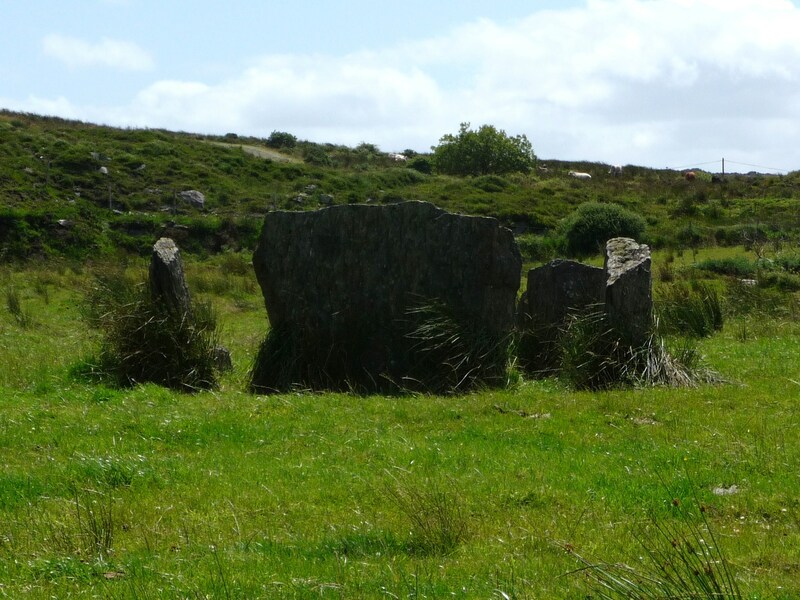 Even though some 50% of sites like this have been destroyed since the second world war, the south-west of Ireland still has plenty (more than anywhere else in Europe). I love to visit them, to sit quietly, to listen, feel, breathe. Each has its own unique qualities, it’s own tales to tell. But I have a soft spot for the Kealkil Stones. There is something about the site that makes the hairs on the back of my neck stand on end. On one visit the mist came tumbling down from the tops and we were suddenly enveloped in a silent white shroud. Time stopped and if someone from 5,000 years ago had emerged, I wouldn’t have been surprised! 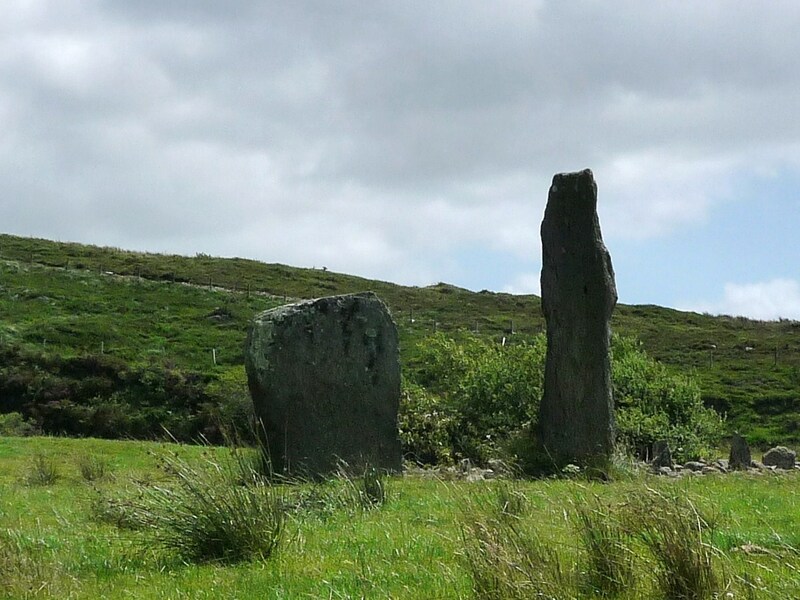 Looking south from the Kealkil Stones, you can just see the sea in the distance. 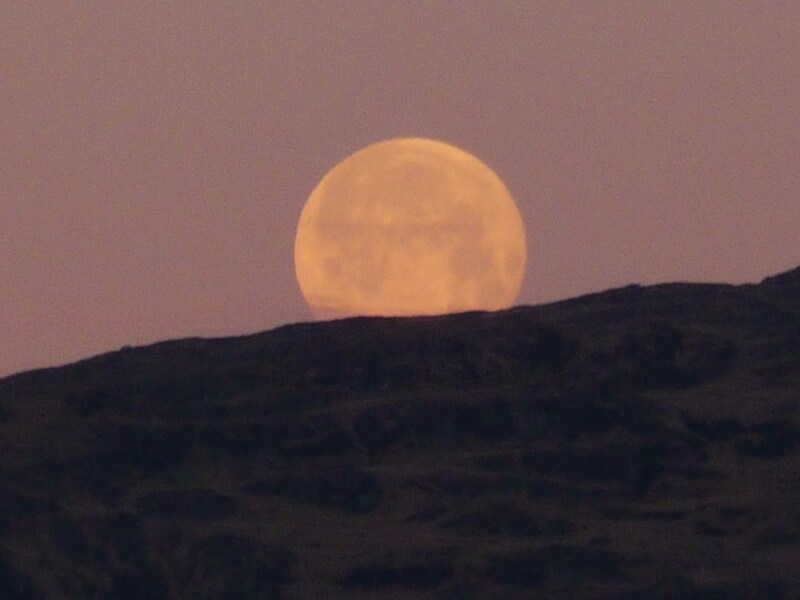 The last Blue Moon that I saw was December 31st 2009. 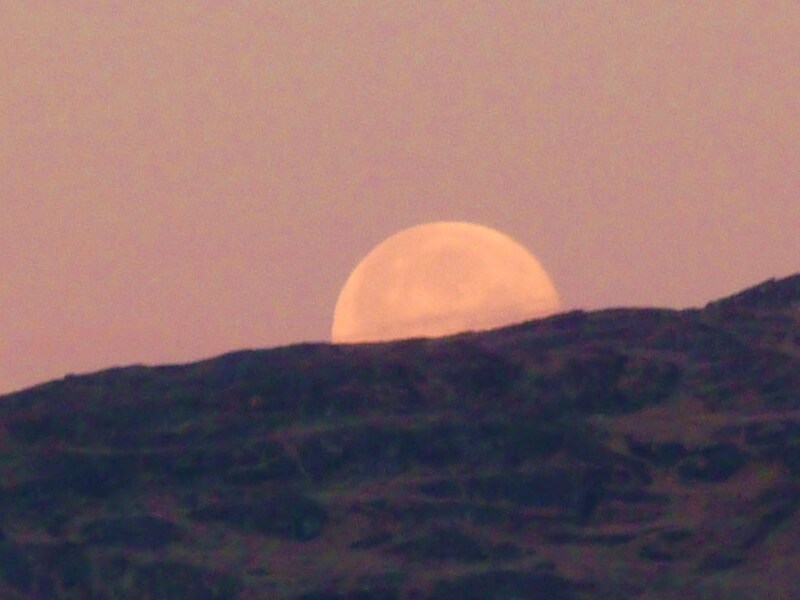 As one year shifted to another, that Blue Moon weaved its way across cold winter skies. I was in Ireland at the time. I watched it before going to bed. Then I watched it when I woke up. 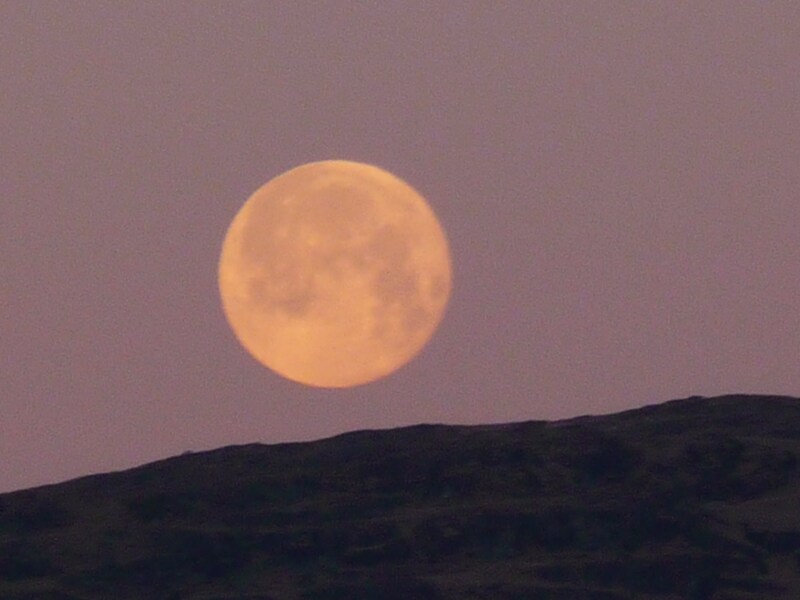 It was still in the sky at 9.00am, heading for the range of hills that I can see from my kitchen. I watched it dip lower.. But the Magic wasn’t over. 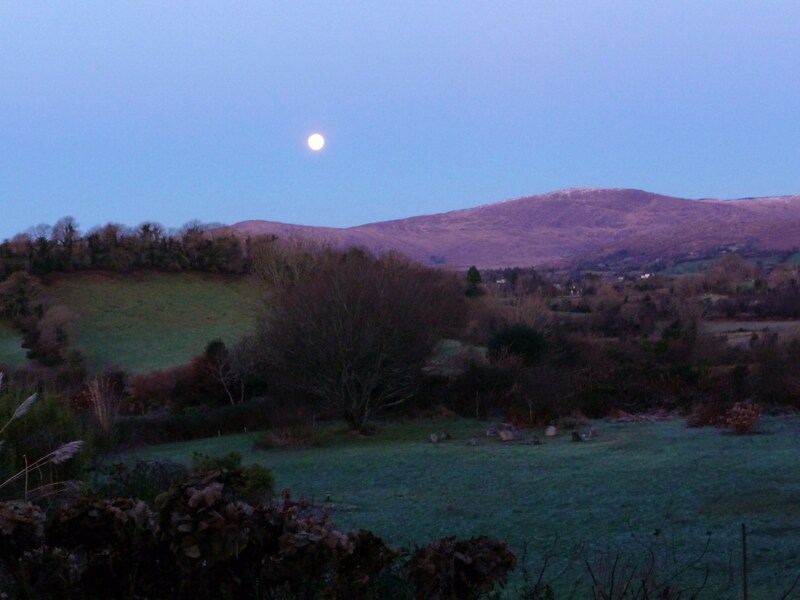 It was New Year’s Day 2010 and a Blue Moon had given way to Sunshine and Snowfall. Pure Magic. The year that followed proved to be just as special. It was the year I finished writing Tilly’s first adventure! Book-signing in Waterstones bookstores is always fun! 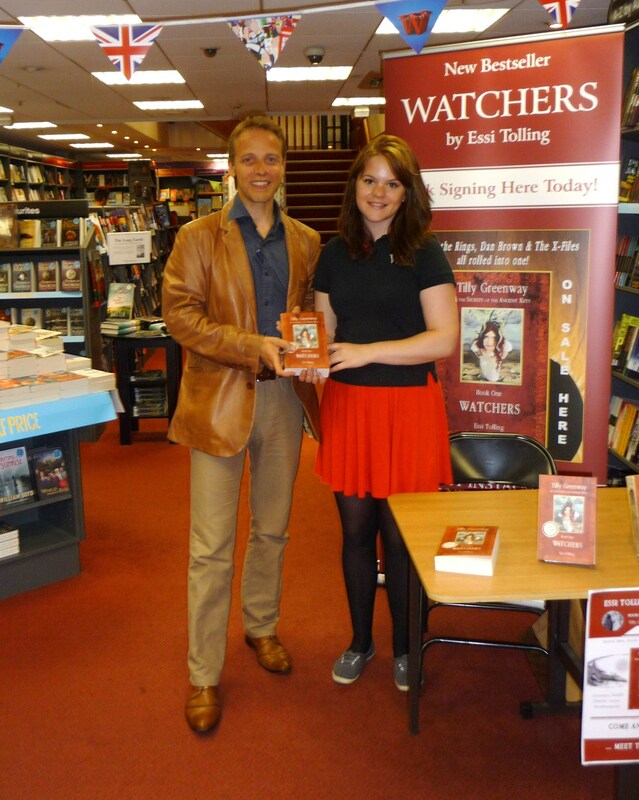 This autumn I’m doing a tour of Waterstones Bookstores, signing copies of Watchers. I started off as soon as I got back from Ireland with a visit to Wells Waterstones on Saturday 18th August. It was the hottest day of the year, which normally means fewer folks are out buying books, but we had a really excellent day with a steady stream of people coming to the desk. Thanks to Sarah and all her staff for helping to organise everything. I really enjoyed my visit with you. 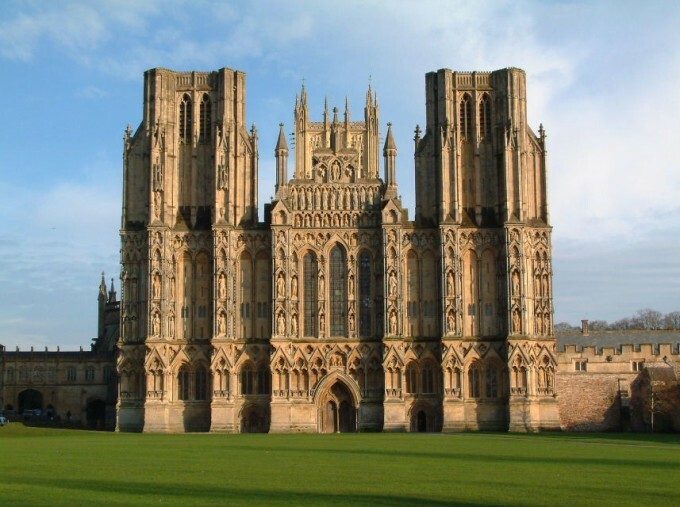 Wells is a beautiful city, full of higgledy-piggledy side streets and wonderful medieaval nooks and crannies. The Cathedral is one of the most spectacular in the country (amazing to have such a vast building in such a small place) and is definitely worth a visit if you haven’t been already (or perhaps another visit, if you have!). One of the pleasures of being back in England is the variety of architecture, spanning so many centuries. 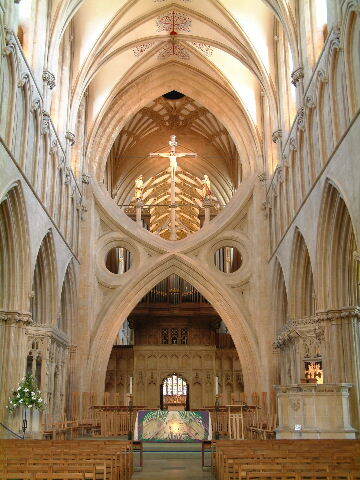 Just look at this fabulous arch-work inside Wells Cathedral! It was market-day in Wells and the streets were packed with people hunting for goodies. It was so hot it felt more like being in southern France than England. Reminded me of when I was 17. A friend and I spent the best part of a year in Provence, picking whatever fruits were in season and doing any jobs we could find. Sometimes we would get up at the crack of dawn to take cherries to the local business-market and afterwards we’d wander back through the village, sampling the wonderful olives, cheeses and fruit. Mmmhmm! There was no market in Camberley yesterday, where I was signing books at the Camberley Waterstones, but as it was a wet day lots of people were out and about (rain is good for book-selling I’m told) and we had a record-equalling day of sales, which was great! One of the things I enjoy about doing book-signings is the chance to meet and chat with people of all ages and from all walks of life. Each meeting is quite brief, but it’s amazing what comes up within those few, short minutes. It seems book-buyers love to tell their own stories as well as buying those written by others! And of course, as I writer, I’m not averse to telling my own…! My thanks to Tracy, Louise and rest of the Camberley Waterstones staff for all your help. Next Saturday, I’ll be in the Haywards Heath Waterstones from noon until 2pm. Do come along for a chinwag if you are in the area. I’d love to swap stories with you! For now, I’d better get back to writing the last chapters of The Hidden Hand – my deadline is approaching fast!